Those looking for a new way to bring potential customers in to their business have a new tool to do so. Facebook Find Wi-Fi has been opened to all Facebook users. Here’s how to use it to bring in new customers to your retail location. Last November, Facebook started testing out a new feature to help users find wi-fi hotspots in their area. This helped connect users (and in turn keep more connected with Facebook and bring them more money). Facebook recently announced that they’d begin rolling out Find Wi-Fi to everyone in the world on iPhone and Android. 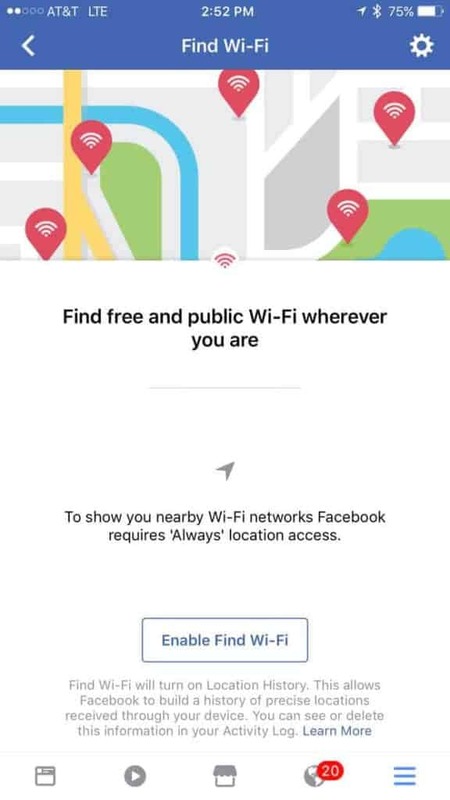 The Facebook Find Wi-Fi tool allows users to find nearby businesses that have shared access to their wi-fi with Facebook users via their business Page. With more than 2 billion monthly Facebook users worldwide, chances are there are plenty in your area. Setup is simple. You must have a Facebook Wi-Fi compatible wireless router. Each offers easy setup for Facebook login. Once setup, visitors who want to use your wi-fi are directed to your business Facebook page. They’re then required to check-in to your business on Facebook before they continue browsing (although you can turn this off if you choose). This means not only will your visitors see your Facebook page and have the opportunity to Like it, but their friends will see they were at your location too, which means they may become curious and check it out also. Though this may not be the most targeted approach to bringing in new customers, it still has the potential to bring in lots of extra visitors to your business and your Facebook page. With Facebook Find Wi-Fi now open to all users, many will use the function to find nearby wi-fi. Listing your business means additional opportunities to be seen and attract foot traffic. It’s a simple step you can take to increase traffic today. You can learn more about Facebook Wi-Fi and how to set it up here.